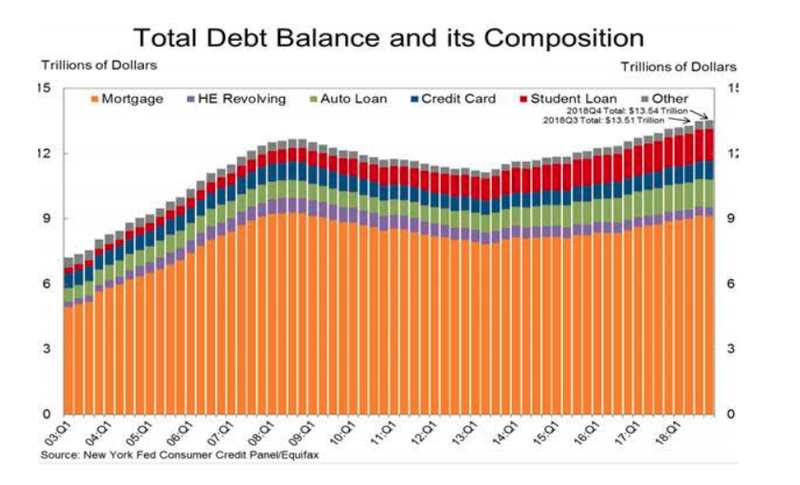 America has never been more indebted. Aggregate borrowing to cover mortgages, credit cards, student loans, and car loans rose for the 18th straight quarter in the fourth quarter, reaching a new record of $13.5 trillion. Especially worrying: more than 7 million Americans have reached serious delinquency status on their auto loans. „The higher debt pile leaves the US much more sensitive to even minor changes in borrowing costs,“ says AJ Bell. In his State of the Union speech this month, US President Trump cited low unemployment and manufacturing job growth as evidence of the „economic miracle“ currently underway in America. It’s likely the Federal Reserve, which is pausing its plan to raise interest rates for now, is using other yard sticks to gauge US economic health. For one, America is piling on debt. Aggregate borrowing to cover mortgages, credit cards, student loans, and car loans rose for the 18th straight quarter in the final three months of 2018, reaching a new record of $13.5 trillion. Especially worrying: A new Federal Reserve Bank of New York report on Tuesday said that more than 7 million Americans have reached serious delinquency status on their auto loans. Fed economists said the surge in delinquent borrowers, defined as being at least 90 days behind on payments, was „surprising“ considering the strong labor market and economy. The chart below shows just how big the American debt burden is. „American consumers [are] exposed to any unexpected loss of their job or increase in interest rates,“ says Russ Mould, Investment Director at UK investment platform AJ Bell. Japan’s government debt also stands at about 200% of GDP.